The percentage of owners who live in RiverPark who own a dog, or two, is roughly equivalent to the number of owners who do not own a dog if RiverPark mirrors national demographics. Driving around RiverPark and making a casual observation should confirm this to be true. Over the past year, the community and the RiverPark Neighborhood Council have started the process of investigating the feasibility of incorporating a dog park into RiverPark to accommodate the dog owners in RiverPark. Dog owners on the RiverPark Facebook communities have been quite vocal and active in pursuing a local dog park. 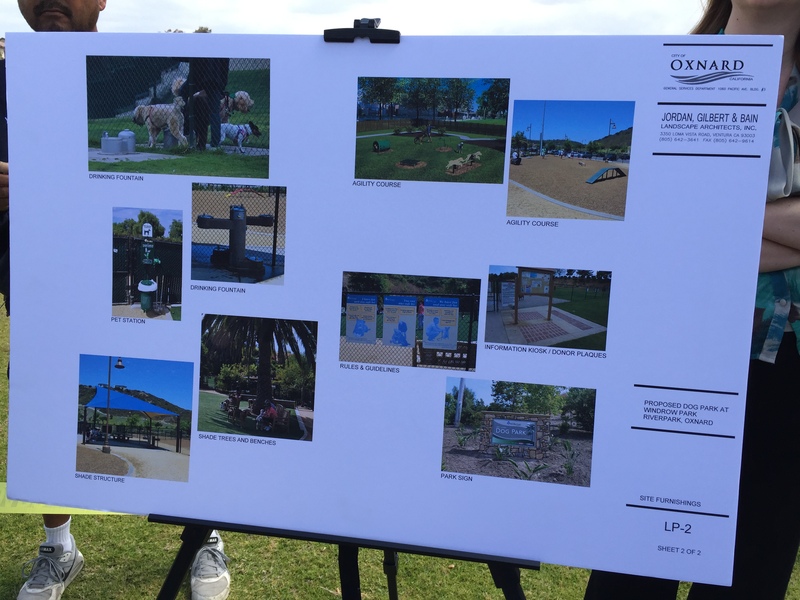 The matter was brought before the Oxnard City Council last April which cleared the path to provide funding for the proposed dog park with existing Mello Roos money. The question now remains is, does RiverPark really have a need for a dog park, and do residents want one? Last Saturday, Justin Glenn and the RiverPark Neighborhood Council conducted a Dog Park Workshop at Windrow Park, the proposed location for said dog park. The workshop provided an opportunity for residents to see the proposed layout of the dog park and amenities. Dean Yamamoto from the City of Oxnard was present to answer questions. He said that the total area of the park comprised 20% of the total area of Windrow Park. 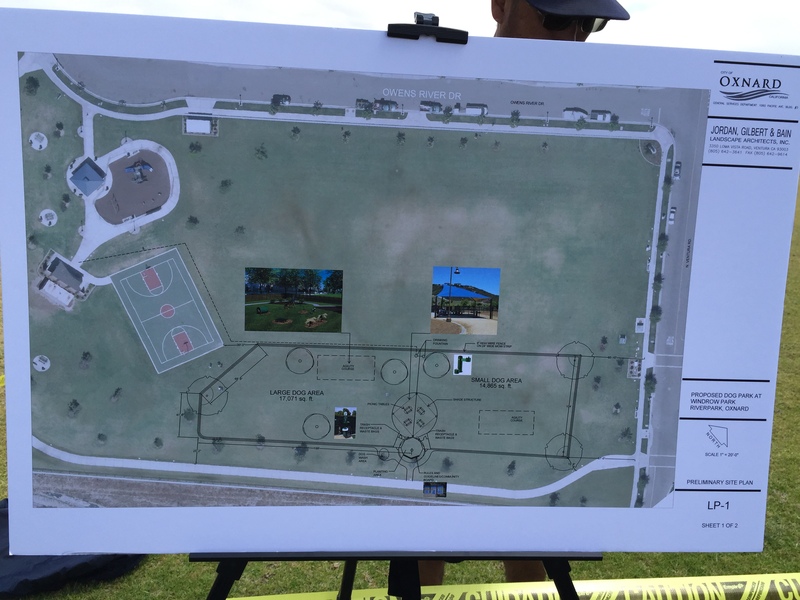 It is located on the side of the park that is furthest from homes and will be adjacent to the future elementary school that is planned to be built within the next few years. This will allow the city and the school board to enter into a shared parking agreement and allow park goers to park in the school parking lot. The proposed dog park is divided in 2 areas. One area is designated for Big Dogs and one for Small Dogs. Residents in attendance had a chance to voice their concerns and suggestions. Residents already walk their dogs through the park and trail for exercise, it already has the amenities needed in a dog park, it is conveniently located within RiverPark, it has existing restrooms, the site only needs additional benches, water fountain, and lighting and it has street parking. The concerns regarding the location are: the very limited parking, traffic impact from outside residents coming to RiverPark dog park, it was originally meant as a neighborhood park and its mixed use could cause future issues, it is not a very large park, it would have an impact on families using the park, more traffic, more noise, more dogs, dog bites/dog fights , irresponsible dog owners who do not pick up after their dogs, residents stated that this park is not a good candidate, Windrow Park has had issues with existing uses, and it would affect all residents who live adjacent to the park. Naturally, the issues of noise and disposal of dog waste were brought into the discussion. Both of which are very valid concerns and need to be adequately addressed by residents and the city as how they will be managed. For now, as a concerned RiverPark resident, it will be important to keep track of developments with the neighborhood council and educate ourselves as much as possible on the subject and not rely on hearsay and prejudicial statements that may be made by either side of the issue. Our video blog will post impromptu visits to local dog parks in an attempt to share the local dog park experience in Ventura County. This blog will update this subject with current studies and data on the impact of dog parks on communities throughout the country. If you have data or personal experiences you would like to share, please contact me. The RiverPark Neighborhood Council is doing its best to prevent any decision on this subject from being railroaded through by any single person or group. No final decisions have been made. This is the time for RiverPark residents to discuss whether or not a new dog park would be an asset or detriment to our community.